We have two dining tables that we need to ‘move on’, so as a result they are currently less than half price! We often make speculative pieces where we try new design ideas; sometimes they sell immeadiately, sometimes they don’t. There is always a client out there somewhere for every piece, I’ve just got to find them! It’s important for us to always have new work in shows, so after a couple of years we will cut the price of a piece that has done all the shows and galleries we can think of. One such piece is our ‘Banquet’ dining table. This was made 3 years ago, the top was made of very large boards of rather uninspiring ash – not really very white but not rich olive colour either, so we bleached and scrubbed them as an experiment and ended up with this beautifully textured white surface. 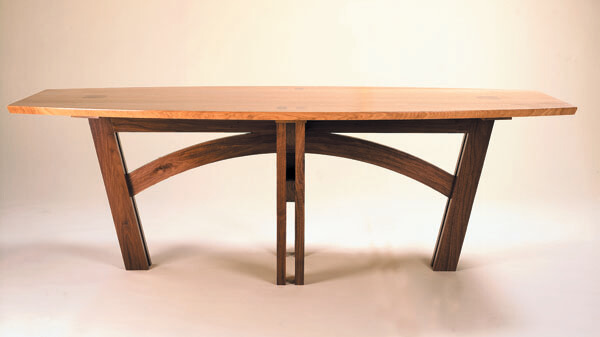 Coupled with the rich green/red/brown tones of the elm curved frame and leg structure it makes a stunning table. The table seats 8 comfortably but can easily accommodate 10. 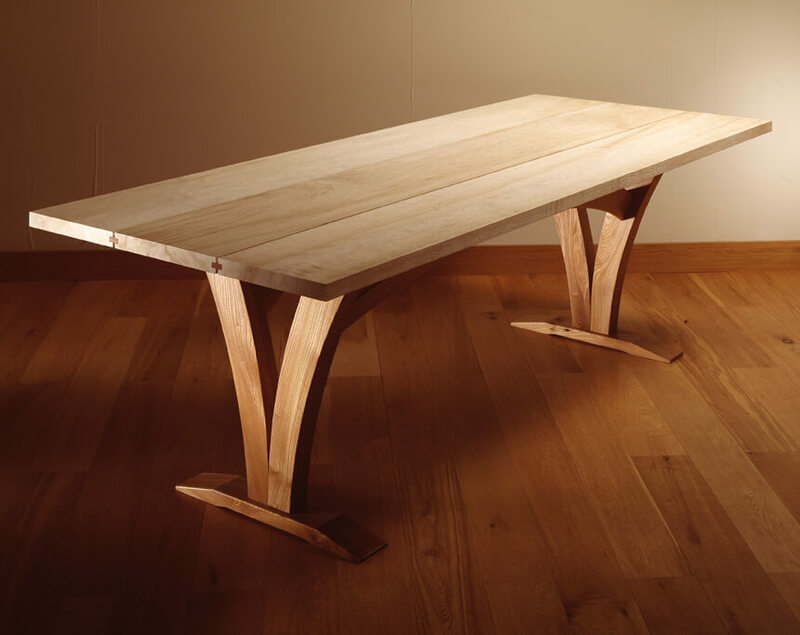 Designed as a contemporary twist on the refectory table I’m still amazed this piece has not sold. As always it is a bit too big, a bit too small, the wrong wood etc etc. But as with all speculative pieces it has generated plenty of conversations, interest and even commissions, but it is time it found a new home! Status: Made and ready for sale. Currently on display at our Dorset Showroom. Materials: Bleached and Scrubbed ash / Scottish elm. The story behind our second dining table for sale is a little different. 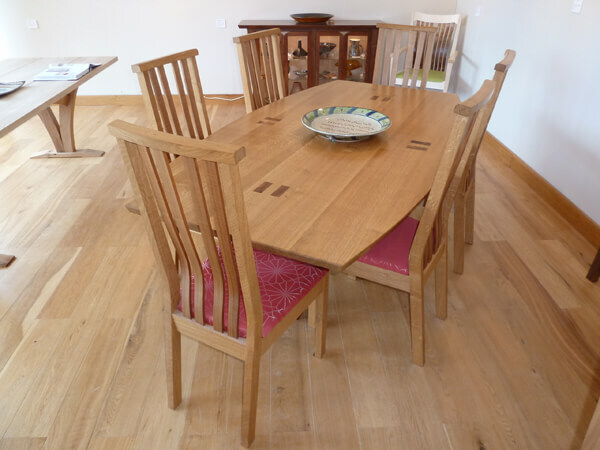 We sold this oak and black walnut ‘Lozenge’ table 2 years ago with a set of matching Impala chairs. The clients have since moved and downsized, but they found that the table is just a little too big for the new dining space. We have designed them a new one and have agreed to sell the old one following a complete refurbishment by us. It will look like new by the time we have finished with it! 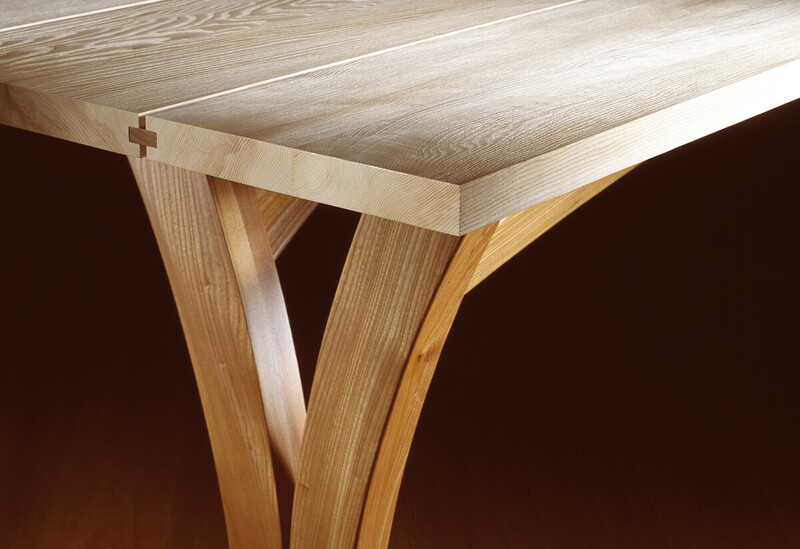 The ‘Lozenge’ table is one of our classic designs, and that timber combination of oak and walnut suits it best. It’s a lovely sociable shape designed to seat 6 in luxury and 8 with ease. Please note the chairs are not being sold, it is the table only. Status: Made and ready for sale. Currently still in clients home in Dorchester but available to view. Dimensions: 200cm x 110cm widest / 75cm at ends, 75cm high. Materials: Oak top, black walnut legs and frame.